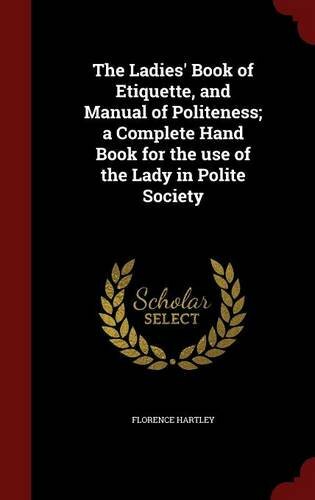 Download The Ladies’ Book of Etiquette, and Manual of Politeness ebook. This work has been selected by scholars as being culturally important, and is part of the knowledge base of civilization as we know it. This work was reproduced from the original artifact, and remains as true to the original work as possible. Therefore, you will see the original copyright references, library stamps (as most of these works have been housed in our most important libraries around the world), and other notations in the work. While some of this advice is antiquated (such as the submissive role of women in society and the author’s “disgust” for “confident or independent women”), it is interesting to see that some rules still abide. For example, rising to speak to your elders is a nicety not always practiced but still appreciated. Women still shouldn’t wear heavy perfumes or diamonds in the morning. However, check out what they say about dealing with servants and traveling as a single woman! You’ll be very glad to live in the modern day away from the patronizing and judgmental tone of your peers! It has been said “well behaved women seldom make history.” This book is evidence.